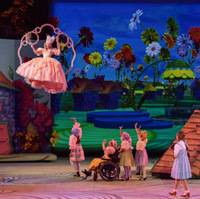 Conservatory students were part of "The Wizard of Oz" at The Muny in St. Louis. After performing in Webster's seven-show season and alongside professional actors and directors at the St. Louis Repertory Theatre, students and faculty in the Conservatory of Theatre Arts remain quite active in summer with professional theaters across the country. Austen Danielle Bohmer (Class of 2017), with understudy Kim MacAfee / Swing in Bye Bye Birdie. Jacob Scott (Class of 2017): 1776 as The Courier with alumnus Dakota Mackey-McGee. Little Edie with vocal faculty Debby Lennon. 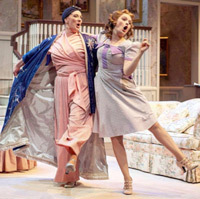 Madeleine Purches (Class of 2017) as Grey Gardens in Young Little Edie with vocal faculty member Debby Lennon. Conservatory professor Rick Dildine was artistic director of the festival, and Melaina Ricks (Class of 2017) was assistant director. Other Conservatory faculty in the festival included Dottie Marshall Englis, who annually does the costume design, as well as John Wylie (lighting), Rusty Wandall (sound), and Paul Denhart (choreographer/stage combat). Brooke Viegut (Class of 2018) was directing assistant on the productions of Damn Yankees, AIDA, South Pacific, and SHREK: The Musical. Company featured Bailey Jordan Reeves (Class of 2016) as April, Cher Alvarez (Class of 2016) as Jenny, and was directed by Conservatory professor Doug Finlayson. Inherit The Wind included Sigrid Wise (Class of 2017) as Rachel Brown as well as Michael Ferguson (Class of 2018), Matthew Luyber (Class of 2017), and Kyle Twomey (Class of 2016). The Last 5 Years included Brenna Noble (Class of 2017) as Cathy and Mitchell Ferguson (Class of 2016) as Jamie. Rock of Ages included Brenna Noble (Class of 2017) as Sherrie, Jeannie Moffitt (Class of 2016) as Regina and Mitchell Ferguson (Class of 2016) as Dennis Dupree. Check out the Alumni page on the Conservatory site for more information from alumni of Webster University's Conservatory of Theatre Arts.